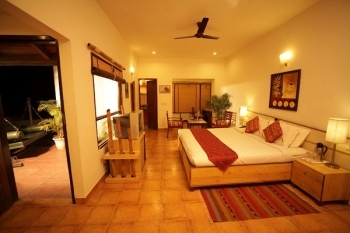 Corbett Country Inn Resort is luxury hotel from Country Inn Hotels and Resorts in Corbett National Park. The magical call of the wild is answered at Country Inn Corbett, a luxurious and an eco-friendly jungle resort adjoining the famous Corbett National Park. With its natural beauty, serenity and proximity to the National Park and the Reserve Forest, the resort provides a unique opportunity to enjoy wild life within natural habitat. Country Inn hotels and resorts combine luxury, comfort and beauty to create spaces uniquely meant for you and your family. The Country Inn TreeTops resort is located in Garjia Villa, very close to the Garjia Entrance Gate of Corbett National Park. Located near Corbett National Park, Country Inn Corbett is an eco-friendly fusion of inviting greens and impressive luxury. Built completely by using locally available environment-friendly materials, the ambience of the resort is matched with an honest endeavor to partner wildlife and nature conservation efforts. 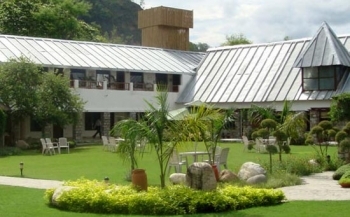 Jim Corbett Country Inn Tree Top's multi-cuisine restaurant offers delightful food options. An assortment of gourmet fare dished out by expert chefs is sure to stimulate your taste buds. Country Inn Tree Tops Corbett conference center makes the perfect location for your next function. Whether you are planning a local business meeting, a regional conference or team building activities you will find a wide selection of general session meeting rooms. The Resort offers comprehensive conference & banquet services equipped with comprehensive range of audio visual facilities, with a capacity to accommodate 400 people in a theater style seating & 100-125 people in a U-Shape seating. - Indoor & Outdoor games at Corbett. - 01 Dinner at our Specialty Restaurant ( Sizzlers ) at Country Inn Corbett. - Natures walk to River Kosi at Corbett National Park. - Family Games & Competitions. - 20% discount on Food & Beverages. - Complimentary Up gradation (one up ) at any one of our resorts. Nearest international airport is Indira Gandhi International Airport, New Delhi. 260 kms from Country Inn Resort in Corbett. The Nearest Railway station is at Ramnagar. Corbett Link Express Departure Old Delhi Railway Station at 10.45 pm Arrival at Ramnagar at 5.30 am the next day From the station, it is 9 km by taxi to The Country Inn Corbett. By Road: The Country Inn Corbett resort is 260 km from Delhi on the National Highway No. 2. Take the route: Delhi - Hapur - Gajraula -Moradabad -Kashipur - Ramnagar - Corbett. Village Garjia (Uttarakhand) is located right on the milestone showing 0 Garjia.